7 Great Small-Sided Games | White Plains Lacrosse Association Inc. These are some of my favorite games I use to create a fun and challenging environment for youth lacrosse players. All of this leads to better development for the kids and more FUN! Also, another way to make the game fun and keep it fresh is to play quick games and make a little tournament out of it; we will give extra conditioning to the losing teams. This is a passing game I stole from learntocoachbasketball.com. Since I’ve started using it, tag ball has quickly turned into my favorite “stickwork drill.” It is great because the action is random and the kids have to constantly read and adapt to the situation rather than just run set patterns. It is also fast paced so the kids learn to move the ball very quickly under pressure. We play this game by getting the kids into groups of about 7 players. 4 players will be on offense and 3 will drop their sticks and play defense. The offensive players pass the ball around and play keep-away from the defense. But if a defender ever tags you while you have the ball, then you must give him your stick and you now become a defender. Defenders can also pick off passes and dive on loose balls; each time a defender gets the ball he takes the stick of the offensive player who was responsible for the turnover and they switch positions. The fact that the kids rotate the sticks around and don’t always use their own stick makes it more fun. For our more advanced players we will do this game with tennis balls to add an extra level of difficulty and promote soft hands. This game is a knockoff of a soccer game I read about from ministry-of-football.com. It is very flexible in the structures that you can use and it is really just an extra layer to add to a simple 3v3, 4v4, or 5v5 small-sided game. Pick 2 or 3 skills that you want the kids to try such as behind the back passes, skip passes, or pick-and-rolls. The objective of the game is for EVERY player on your team to successfully complete all of the skills during the game before the players on the other team. They are still trying to score goals but the score of the game is not kept by number of goals but rather a race to see which team can successfully complete all of the skills first. You can also consider a “successful completion” of a skill as one that results in a goal; for instance a pick-and-roll that scores a goal. One of the coolest aspects of this game is that the best players typically complete all of their skills first so they naturally spend the rest of the game to trying to help setup their teammates so they can do the skills as well. Treasure hunt is one of the coolest tweaks to small-sided games I have seen in a long time! This game is also very flexible in how you want to run it, but the basic gist is that each time a player scores a goal he must come out and, therefore, his team has one less player. The object is to get your team down to 0 players left. Once a player scores a goal, he goes to the sideline and he is still an active passer; you can pass him the ball and he can pass it back but he must remain along the sideline. This way the players that score aren’t getting bored and also the last player left still has the ability to make a pass and try to score using an off-ball cut rather than just dodging. I prefer to play this game either 3v3 or 4v4 so the games don’t last too long. By eliminating the player that scores each time, the game naturally prevents itself from becoming too lopsided with one team dominating. Something interesting you will notice if you play this game a few times is that the best players often don’t want to score right away so they will go out of their way to try to assist their teammates (even if they are doing it for selfish reasons). This is a great game to play with young kids because they get all fired up and it turns into pure chaos. For this game you split up into three or more teams. Put goals in large circle where they are facing the middle; each team has a goal to protect. Put all of the balls in the middle of the circle. On the whistle each team tries to score goals on opposing nets while at the same time protecting their own. Once a ball is scored in the goal, it must stay in the goal. After all of the balls are scored, count which goal has the least amount in it and that is the winning team. This game is definitely better played with tennis balls so that aren’t multiple lacrosse balls whizzing at a kid trying to protect his cage. You want to play this games multiple times in a row because once a team wins once or twice, the other teams will start to gang up on them and try to score all of the balls in their net. Again, the point of this game is just pure chaos and fun! This is a game I got from Jamie Munro of 3d Lacrosse and it is one of the best ways to get young players comfortable making contact while carrying the ball. Cone out a small area and have every player start with a ball in their stick. The object is to bump into other players and make them drop their ball without dropping yours; I make the kids keep two hands on their stick the entire time. Each time a player drops his ball or he steps out of the boundaries he is out of the game. You can play this game down to where there is only one guy standing or what I prefer to do is have the kids who are out do a skill (such as 10 scoops) then they can get back in the game. Again this game is all about getting comfortable being physical with the ball and maintaining possession through contact. I try to remind the kids to not push people from behind but it is actually not a bad thing (as crazy as that sounds) because it does force them the ball carrier to develop awareness of his surroundings in every direction; how often in games do young kids get stripped from behind because they had no clue a defender was behind them!? This game really has nothing to do with the Star Wars franchise (don’t sue me Disney!) it was just a cool name I came up with on the spot when introducing it to a bunch of 1st and 2nd graders. Split into 2 teams, one team is going to be the attacking team and one team is going to be the defending team; they can switch roles each round. Put a couple of goals at one end of the field. Start the attacking team on the opposite end line of the goals. 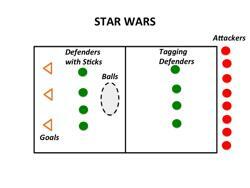 Half of the defending team will drop their sticks and be “taggers” and the other half will keep their sticks and defend the goals. The “taggers” must stay on the far half of the field and they are trying to tag attacking players. The defenders with sticks must stay on the half of the field with the goals and they are trying to stop the attackers from scoring. The attacking players must first try to run past the defenders with no stick without getting tagged and then pick up a ball and score on the defenders with sticks. Each time they get tagged or lose the ball they must run all the way back to the far end line and start again. You count a point for each time the attacking team scores a goal.